Disqualification clauses are articles of laws which stipulate that deaf people are not qualified to obtain licenses for certain occupations, etc. Some even prohibit the Deaf from taking the qualifying examinations. In June 2001, most of those disqualification clauses were eliminated as a result of a nationwide movement led by the “Headquarters for Revision of Laws Discriminating Persons with Hearing Disabilities”, established in partnership with different organizations related to persons with hearing disabilities in 1998. On March 25th 2005, the disbandment ceremony of the Headquarters was held near Tokyo Station. However, questions remain as to whether all discrimination against persons with hearing disabilities have really been abolished. We take this opportunity to reflect back on the progress of this movement. 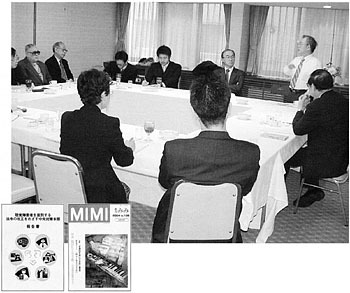 From 1996 to 1997, the Japanese Federation of the Deaf (JFD), the promoter of the above Headquarters, celebrated its 50th anniversary and initiated the “National Caravan of the Deaf for Discussion with Governors”. JFD made an appeal to the Japanese public and administrators for early realization of “Full participation and equality” of the Deaf in society, in partnership with other organizations related to the Deaf. They also requested the revision of discriminatory laws which stipulate that “Deaf People cannot obtain qualification”. These laws include the Road Traffic Law Article 88 and other laws prohibiting Deaf people from obtaining licenses in the medical and other specialized fields. After National Congress in 1997(in Saitama Prefecture), a nationwide movement was started, aimed to revise Civil Law Article 969, which stipulated that no notary deed drawn up with the assistance of sign language interpreters and/or note takers will be accepted. As a result of the movement, the Ministry of Justice responded that they would look into this matter from a positive perspective. In December 1997, JFD sent a petition requesting the revision of the Diet (National Legislature) Bill on Speech Therapist Qualification which included the disqualifying clause that “deaf people are not eligible for obtaining qualification”. In spite of such efforts, the Bill with disqualification clauses was adopted at both the House of Representatives and House of Councilors, though an accompanying resolution was attached to review the disqualification clauses in the actual enactment of the law. This incident strengthened the partnership with other organizations such as the All Japan Association of Hard of Hearing People and accelerated the movement to abolish the discriminatory laws. 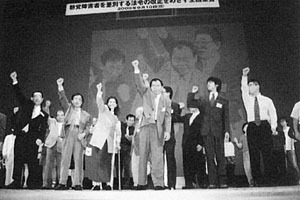 In June 1998, at the General Assembly of JFD held in conjunction with the National Congress in Aomori, JFD decided to advance the movement to eliminate all legal discrimination in order to realize the “revision of all disqualification clauses”, which was one of the targets in the National Action Plan for Persons with Disabilities, adopted in 1995. In 1998, the current President of JFD, Toyoki Ando, was elected as president for the first time at the National Congress (Aomori). So in 1998, JFD made a fresh start with the new movement under the new president. In July 1998, JFD set forth its “Action Policy for the Movement to Revise Discriminatory Laws”, which focused on the collection of 1 million signatures from the general public, fundraising, and petition to national and local legislatures. With this policy, JFD invited other national organizations related to persons with hearing disability to participate in the first joint movement and launched the Headquarters in autumn. The office was located within the head office of JFD. Toyoki Ando, President of JFD was elected as director and Masayuki Matsumoto, General Secretary (sitting Vice President) of JFD was appointed as General Secretary of the Headquarters. While the Headquarters started negotiations with relevant ministries in November 1998, local headquarters were established in 47 prefectures throughout Japan by the end of January 1999. The Headquarters and local headquarters started signature collection and fund-raising activities as well as lobbying local assemblies to adopt statements. As a result of these endeavors, the Headquarters collected a total of 2,236,198 signatures and 70,157,827 yen as donation. Both the number of signatures collected and the funds raised far exceeded the expected target. The Headquarters submitted the signatures to the chairpersons of both Houses on March 29, 2000 and to the Health and Welfare Minister (deputy chief of headquarters to promote policies on persons with disability) on May 19, 2000. As a result of lobbying local assemblies with petitions and signature collection, 1030 local assemblies (49 prefecture, 359 cities and wards, 515 towns, 110 villages) adopted their statements. This created a large impact on Japanese society. The Headquarters collaborated with an unprecedented number of wide-ranging organizations related to persons with hearing disabilities, and reconfirmed the fact that the revision of the discriminatory laws was an earnest hope and important goal for persons with hearing disabilities. The accomplishment brought about by the cooperation of the 9 organizations that conducted activities together in the streets and lobbied together at government assemblies showed us the way to carry out movements into the future. The Headquarters issued the “News on Revision of Discriminatory Laws” 9 times during the 2 years that it conducted the movement, and organized the “General Assembly for Revision of Laws which Discriminate Persons with Hearing Disabilities” in Tokyo in February 1999 and in September 2000, gathering 330 and 1200 participants respectively. Because many of the discriminative laws and clauses were related to the medical field, the Headquarters also established a Research Committee on Laws and Regulations on June 6th 1999, with support from experts such as physicians and nurses. The Committee analyzed the contents of the work actually performed in the medical field and conducted a research regarding the current condition of persons with hearing disabilities who are employed in the medical field. As a result of these activities, the “Bill for Partial Revision of the Medical Practitioners Law to Ensure the Appropriateness of the Reasons for Disqualification Related to Persons with Disabilities” and the “Bill to Partially Revise the Road Traffic Law” were adopted. However, even though the clauses which contain provisions for “persons who cannot hear and persons who cannot talk” were eliminated and absolute disqualification clauses were abolished, the discriminatory policy still remained with comparative disqualification clauses stating that “persons who are designated in regulations of ministries as those who cannot conduct certain specific work appropriately due to his/her disability, are not eligible to obtain licenses”. This left concerns about how the revised laws would be applied to each case and to what extent sign language interpretation would be accepted as an auxiliary means. In the meanwhile, the Japanese Government has started considering the legislation of a national anti-discrimination law against persons with disabilities in response to the movement to adopt the UN Comprehensive and Integral International Convention to Promote and Protect the Rights and Dignity of Persons with Disabilities. The Headquarters published a report on the progress of this movement in June 2004. In the report, the Headquarters admitted that there are still problems left to be solved, including the abolishment of disqualification clauses such as the amendment of the Road Traffic Law, Enforcement Regulations Provision 23 (Aptitude Test) which requires some residual hearing. JFD will include this issue in its own agenda for its negotiations with the central government ministries and continue the efforts until all discriminatory laws and regulations are eliminated. On March 25th 2005, the disbandment ceremony of the Headquarters was held at Ryumeikan in Yaesu, Tokyo, attended by 15 representatives from all 9 organizations. It was commonly agreed that the movement to revise the discriminatory laws will end only when the working environment and educational environment to acquire qualifications and licenses are properly provided for persons with hearing disabilities. It was also decided that the remaining funds of the Headquarters amounting to about \3,500,000 (approximately US$32,000) should be donated to the Japanese Federation of the Deaf to be used for the movement to advocate for the rights of persons with hearing disabilities. We believe it is absolutely necessary to include persons with hearing disability in all the deliberations and discussions on the revision of the Ministerial ordinances. It is also important to check local ordinances, such as regulations for civil-service examinations. We commit ourselves to solving problems standing in the way of Deaf students, especially problems related to information-communication support systems, and will endeavor to establish an “environment which enables Deaf students to realize their dreams”. Movements to establish support system for Deaf students, who are trying to acquire qualifications, are necessary. The support system includes information-communication guarantee during lectures. We will continue to strive toward the realization of education in which Deaf students can learn to be independent in society and foster their dreams. We supported the movement by lobbying local governments, collecting signatures and awareness-raising activities aimed at society under the initiative of local headquarters located in each prefecture. Strengthening lateral ties with interested organizations was one of significant achievements. We hope the children of the members of our association will meet the challenge to pursue different professions under the revised laws, in response to the warm assistance from many supporters. Deaf education in Japan is confronted with a time of change from “special education” to “special support education.” In adapting to this change, we would like to contribute to the development of Japanese Deaf education by playing our role as PTA to establish a desirable environment for Deaf students. Our local branches made collective efforts with local headquarters for signature collection, fund-raising and petition activities. We presented a theoretical validation of the movement to abolish discriminative laws in our journal “Research Journal on the Problems of Sign Interpretation” and succeeded in deepening an understanding of the issue. The revised laws are pointless as long as a discriminatory environment in the process of acquiring qualifications under law exists within society. We will continue our efforts to realize a total elimination of discrimination in a true sense together with friends whom we met through the movement. At the disbandment ceremony, we verified concrete results of the enactment of the revised laws as there had not been enough follow-ups since the revision of discriminative laws. It was recognized that problems still remain such as the lack of information and communication support for students with hearing disabilities after they are accepted into medical colleges, or the failure to amend the discriminatory regulations concerning the qualification testing. However, we also acknowledged that the revision of discriminatory laws brought positive changes in many ways. For example, qualified persons with hearing disabilities no longer need to conceal their disabilities. We closed the disbandment ceremony with conviction that in the future, the revised laws will be enforced effectively in different fields with the backing of the current movement to adopt the UN Comprehensive and Integral International Convention to Promote and Protect the Rights and Dignity of Persons with Disabilities and to legislate a national anti-discrimination law against persons with disabilities in Japan.